The R. Bernard Reeves Scholarship was created by the alumni brothers of the Zeta Delta Chapter of Kappa Alpha Psi in 2015. Our goal for this campaign is to reach the $25,000 level, which will allow the scholarship to be awarded annually to an undergraduate student at UNC Charlotte. The level of positive impact that Bernard had on all the chapter brothers and campus community is difficult to put into words. He provided the example to all of us of how to carry ourselves as a positive contributors to society and good "Kappa Man". 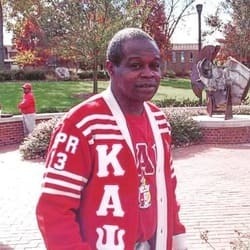 Bernard was and always will be a Zeta Delta and UNC Charlotte institution and we want to honor his legacy. We hope that this scholarship will serve as a token and symbol of our appreciation for his nearly 40 years of service and dedication to the chapter, the fraternity, and to the university. Please help us honor Bernard Reeves, and support the future UNC Charlotte greek students by donating today. R Bernard Reeves was a native of Charlotte and graduated from Olympic High School in 1968. He then enrolled at UNC Charlotte. Bernard was then drafted into military service and left school for 2 years. The Zeta Delta Chapter of Kappa Alpha Psi was chartered and founded in 1970. The Zeta Delta chapter was the first NPHC organization to be founded at UNC Charlotte. Upon returning to campus, Bernard pledged to become a member of Kappa Alpha Psi. He was initiated as a member of the Zeta Delta chapter in 1973 and then graduated from UNC Charlotte in 1976. Post-graduation, he became the graduate advisor of the Zeta Delta chapter. He served as the chapter advisor from 1977-2015. During his time as advisor, Bernard served as a mentor and big brother to nearly 300 brothers that were members of the chapter as undergraduates. We lost Bernard on October 18, 2015. Bernard was initiated as a member of the Zeta Delta chapter in 1973 and graduated from UNC Charlotte in 1976. Bernard became the graduate adviser for the Zeta Delta chapter. He served as the chapter adviser from 1977-2015. Bernard served as a mentor and big brother to nearly 300 brothers that were members of the chapter as undergraduates. Bernard had nearly 40 years of service and dedication to the chapter, the fraternity, and to the University.